When I wove up various samples for the Guild of Canadian Weavers Test, one of the weave structures I had to study was an older weave structure called M's and O's. I thought it looked pretty, almost like a poor cousin to the lace weaves. It seems it has an interesting history! its believed to have originally come from Finland to America (and Canada) via Finnish settlers. They brought it with them along with their homestead belongings and shared in their new communities. it was called Sålldräll in Sweden. What does that mean exactly? Well, a search on the internet didn't get me any answers (in English!) so perhaps one of my readers can share with us in the comments. Weaver Rose called it "Buckens and Owls" (this link takes you to a book review about the Weaving Roses of Rhode Island. Many of their drafts appear in Marguerite Porter Davison's book. an interesting historical tid bit: Well's Dictionary of Archaic and Provincial Words, published in London in 1850, in its correct spelling: buckeens. It is an Anglo-Irish word which formerly denoted a young man of the second-rate gentry or a younger son of the poorer aristocracy who aped the manners of the wealthy. The buckeens would spend the night drinking whiskey and carousing in the halls and taverns and other disreputable behaviours. So the buckeen and the owl are both night-birds, hence the association of ideas that brings the two words together. So why they named a weaving pattern after this is beyond me! So what exactly is M's and O's anyhow? Its a simple weave structure that combines plain weave with a textured rib weave. It depends on thread distortion to create the familiar M's and O's. The ribbed sections are looser and so curve around the plain weave block and make the O's. Much like huck lace, the curving of threads happens off the loom and even more after wet finishing. Its a nifty one shuttle weave that has a simple threading and treadling. The treadling is based on 'weaving on opposites'. On a four shaft loom you get two blocks *. A "block" is made up of eight ends (also known as a unit), which is repeated at least twice to make a block. This is the tradition, but there is no hard and fast rule about block size, so one unit can also make a block. Mary E. Black's Key to Weaving says there are two blocks on four shafts, three blocks on six shafts and four blocks on eight shafts. Of course Sharon's little method above could probably eke out an extra one or two blocks somehow! Now to clarify, I'm not calling this a unit weave but simply referring to a threading group as a unit. The warp ends in one block weave plain weave as individual ends while groups of warp ends weave together in plain weave order with the same weft in the alternate ribbed block. Since pattern cannot be woven in both blocks at the same time, M's and O's is not a true unit weave. Click to enlarge this draft. By referring to the threading guide above, you can see the following blocks (right to left of course) : 8 ends plain weave, A, B, A, A, B, B, A, B, B, A, A, B, A, 7 ends plain weave. The tie up has Block A on treadles 1 and 2. Block B has treadles 3 and 4. You can see the treadling is based on opposites. The plain weave is threaded on the selvedges but not part of the treadling sequence. You can see the areas of plain weave (A) that surround the ribbed sections (B). Classic M's and O's is best if the warp and weft are the same smooth yarn and also the same colour (much like other laces). Novelty yarns, boucle and flake yarns all obscure the pattern. The floats can become lengthy so finer threads are best. The floats can slide around so a fibre with some bite to it is best to hold in place them such as cottons, linens and even some silks. The ribbed sections tend to pull apart easier and should be balanced with the plain weave blocks to produce a more stable cloth. Spread the blocks around! Also ribbed sections will pull apart if the sett is too loose but then again, setting the threads too close won't improve the cloth either. It's best as a balanced 50/50 weave! If a section of a given block is planned wide, then its best woven shallow; narrow sections look good woven deep. So what type of cloth is possible with M's and O's ? Well, its fully reversible and I have seen some very pretty valance curtains woven in cotton. Full curtains on sunny windows filter the light nicely. Linen is the best choice as it resists 'sun- rot'. The surface floats mean it would make great cotton toweling and be absorbent. Its traditionally woven in linens for table cloth and runners and even hand towels. 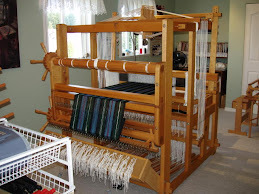 Here is an example of a runner I wove some years ago on a four shaft Leclerc Artisat loom on loan from a guild. I used 40/2 linen from Belgium, sett at 36 epi. It gets softer with each washing and I'm so glad I slogged away on stuck with all ten yards of it! The rest were sold at sales of course and I have saved this last one for us. The linen is very fine at 6,000 yds/ lb, and I can see now that it should have been beaten harder to square. I also didn't know the trick about selvedges then but I think my edges turned out okay! You can also turn the draft and weave turned M's and O's! The main stripes will now go side to side. There are also some interesting effects that can be done when you think outside the box. If you have Handwoven Magazine, Nov/ Dec 2004 issue, pages 42-44..... take a look at the turned M's and O's scarf there that looks like honeycomb. I love this new take on an old weave! When it comes to planning a balanced design using M's and O's I found a profile draft very helpful. So as a bonus this time, I'm going to discuss how a Profile Draft works. On my silk scarf profile draft, I arranged the block into a balanced pattern and this is how I wove it based on using the M's and O's threading. The line in the center is just that, the center, and the pattern reverses from there. ... and in this picture you can see the ribbed cells curving around the plain weave blocks. This scarf is beaten to square and you can see the difference that a balanced weave makes. You work out how many shafts you have available to weave with , then how may blocks are possible depending based on your 'preferred' choice of weave structure (such as 4 blocks with overshot and two blocks with huck etc), and play with arrangement of the blocks and the colours you want to use. For example if you are planning a baby blanket with several colours in the warp and weft, then the block arrangement you have chosen may look better woven up in Summer and Winter than your first choice of M's and O's. The different weave structure may blend the colours better or produce a better block arrangement, such as using crackle, for your project. Thank you for this great expose on Ms and Os. As always, your posts are a great resource and your examples exquisite. I'll be coming back to this, I'm sure, several times again. Stay cool! "dräll" (often referred to as "äkta/true" dräll) nowadays usually mean turned twill (or turned satin), thus min 2 blocks. In older Swe literature, dräll often is used to indicate "patterned". 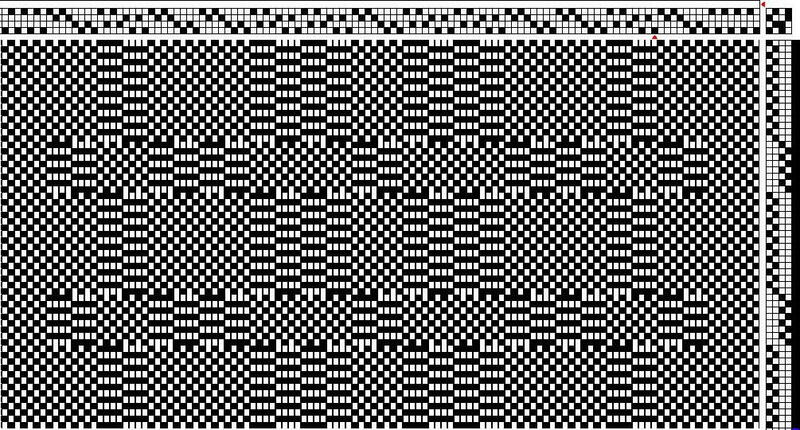 Even "just" a (say) 8-sh twill pattern (no blocks) can be referred to as "kypertdräll" (kypert=twill). On your blog Kerstin explained the origin of the Swedish name Sålldräll. 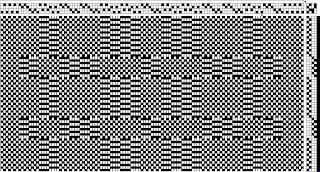 Dräll is the name for a patterned weave and såll is a sieve. The old Swedish sieves were made with a frame of thinly cut wood which was then bent into a circle. The woven mesh of the sieve was made in plain weave. So, when you wash a fabric with a woven Ms and Os pattern, the plain woven squares become circles and look like a plain weave woven mesh of the circular sieve. Thank-you Susan, Kirsten and Joanne for your translation input. I take it that Sålldräll and Sållväv refer to the same weave structure. My Swe/Eng glossaries by Marie C Hayes and Boris Veren, respectively, suggest this is the case. They also offer a variety of English names for Sålldräll which only confuses this reader: M's and O's, Poor Man's Huck, Gauze Weave and Open Weave Damask. yes WeaveBlah... and you can add Buckens and Owls to the list as well. The many names for just this one weave structure demonstrates the difficulty facing anyone trying to do research into old textiles. It seems that weavers in different countries, and then within the borders of any region all came up with names and terms of their own to describe a weave structure. For example the Swedish weave jamtlandtvav (sp) was 'rediscovered' by Mary Meigs Atwater and she called it crackle as it resembled the crazing of a pottery piece. Later, a lace structure was called Atwater lace and it was amended to Bronson-Atwater as another contributor was discovered. Weaving is an ancient activity and no doubt there have been many names along the centuries. If you look at medieval texts, you would barely know what is what with either cloth or food items based on the strange names of things way back then. Thank you for this in-depth blog post! Thank you again for sharing all your knowledge. The silk scarve is just what I was looking for while I was planing my new project. I hope it.s going to look as beautiful as yours. In german this setting is called Bettelmannsdrell which means the same as poor mans huck.